My ScanJet 6300c had some minor issues but we’re back online. 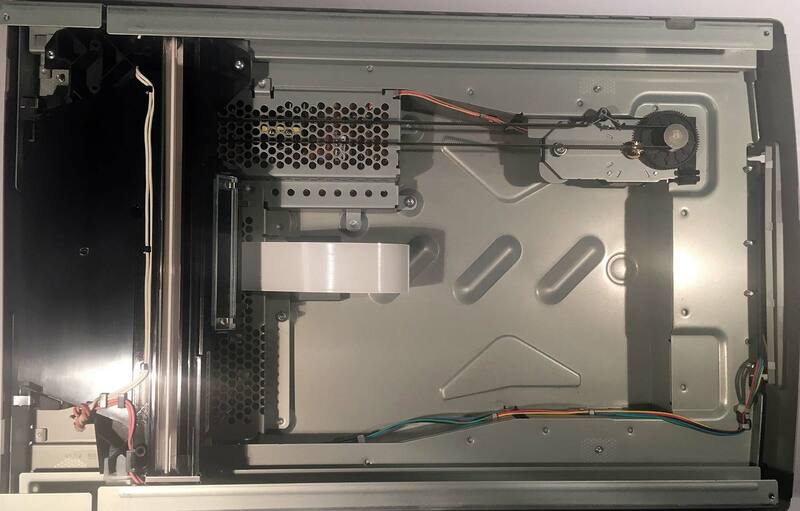 I just want to show you some quick pictures and guide on how I fixed my Hewlett Packard (HP) ScanJet 6300c to be as good as new again. The unit is approaching 16 years of age and is no longer officially supported by HP due to a planned obsolescence model that many newer companies now adopt. (some would say that HP was the leader in making hardware useless in a matter of years.) Perhaps that’s being a little too hard on a company. I scan a lot of physical copies of art sketches as you can plainly see by going to the sketches section of my site. 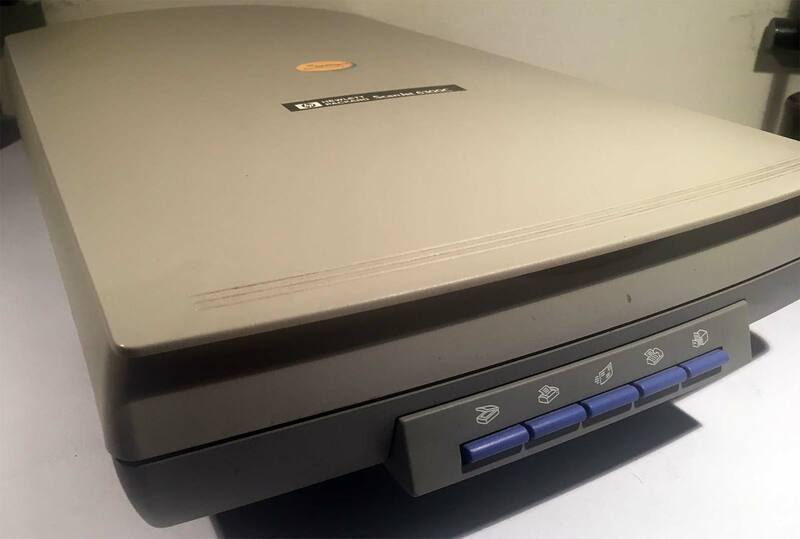 It’s a 600dpi color flatbed scanner which has buttons on the front of it which are totally useless unless you have a windows XP box kicking around to actually install the HP Drivers. It did come with other options like an ADF feeder however I picked this up almost 12 years ago for about $25 and it has been working fine up to the date of this blog. This scanner is what I use whenever I need to digitize any of my analog level artwork for archival and to bring it online. It’s also handy for some of my Ebay work where I have to scan very small things to put online such as RAM chips or even hard-drive numbers. There is many scanners from HP which are far more powerful and most people would probably even say it’s better to go with MFP (Multi-Function-Printer) technology. But the problem with multi-function is serviceability and also general usability. If you buy an inkjet MFP it will last for maybe a year or two before the inkjets get totally clogged. And Color-Laser-MFP is really expensive. So for us at least going with a stand-alone flatbed scanner is the way to go. All support for the ScanJet 6300c ended with windows XP. If you attempt to load the driver onto a Windows 7 box or worse still a windows 10 box you’ll quickly find out that installation makes it virtually impossible. However, thanks to VueScan which is a third party company updating twain drivers to work on later versions of windows we were able to bring this scanner back from the dead and keep is rocking. The picture above is the problem that appeared about a year back but is getting progressively worse as time goes by. 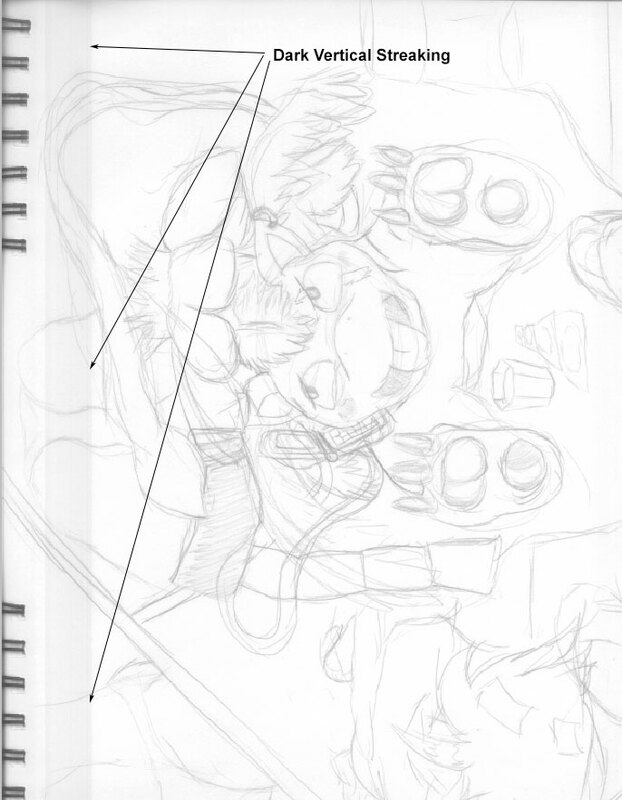 A dark 1/2 inch streak that goes right down the sketch book missing with the darkness adjustments of scanning. This is now affecting image quality of the scans that I do. I began to open my ScanJet because the warranty on this unit has been gone for 10+ years now. Disassembly is super easy with this unit, you only need a paper-clip and a T-10 bit screwdriver to go as far as where we need to go today. 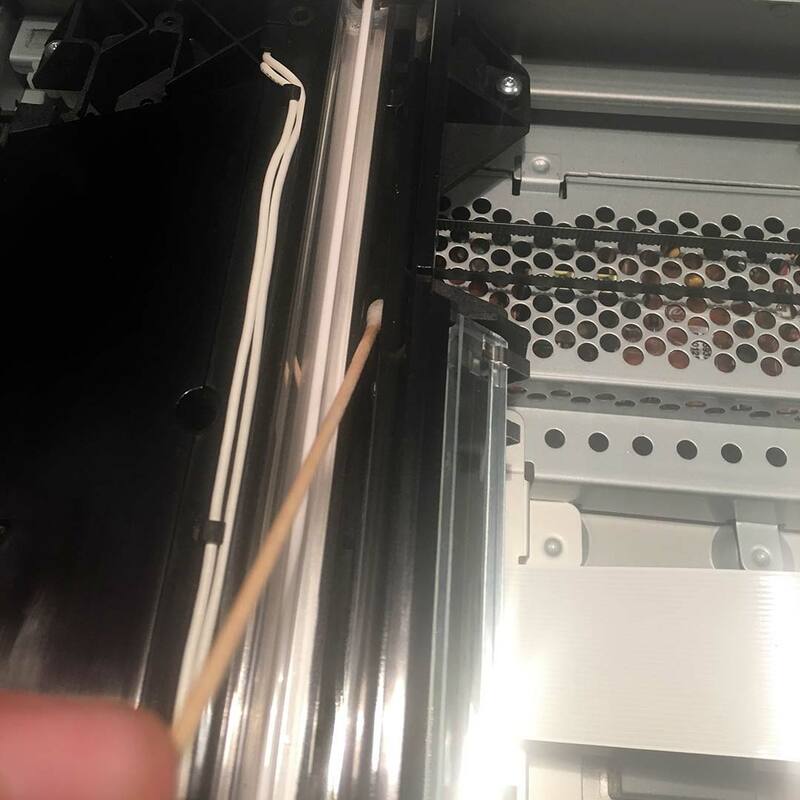 Also, make sure that the scanner is unplugged as we don’t want to damage the stepper motor or the back lights during its operation. 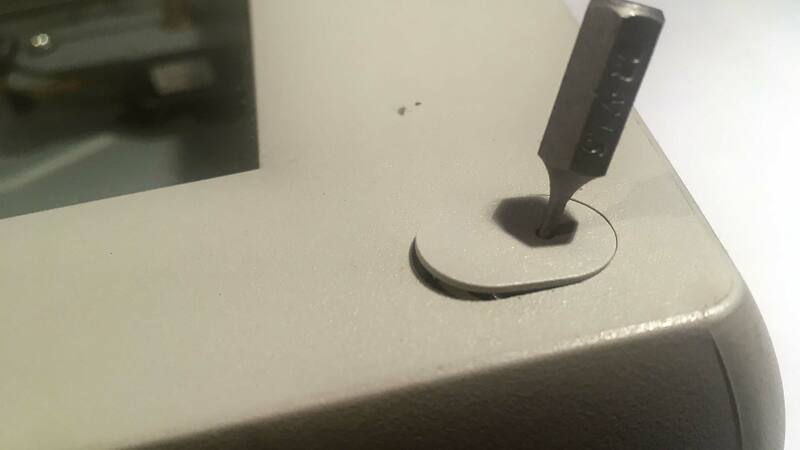 Using a paper-clip or a very small bit you can unlock these little plastic tabs exposing the front T10 screws holding the top bezel glass in place. 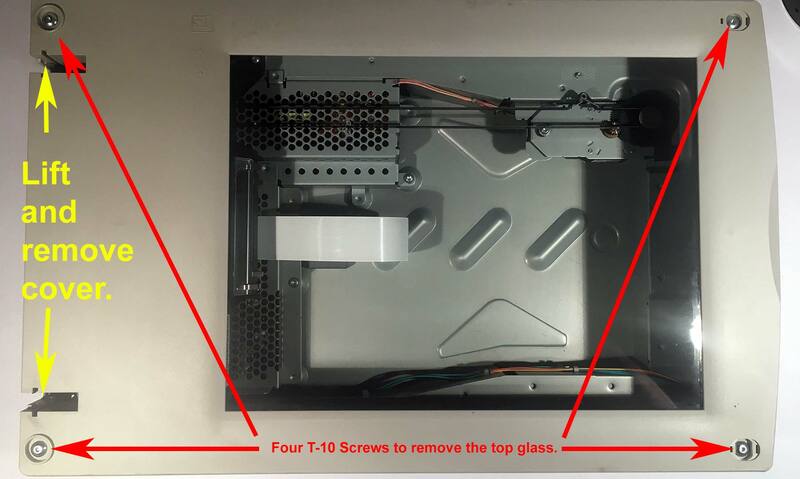 Removing lid and T-10 screws. Lift the protective cover straight up and out of its notches to expose the rear T-10 screws. Then unscrew all four T-10 screws. Once you have it removed the upper bezel with the glass installed on it now would be a very good time to use some windex. Clean both sides of the glass. Mine was especially dirty as dust may have managed to get inside over the many of years we have had this unit. Once you have your upper bezel remove this will expose your stepper motor. The backlights, and the optical head that reads everything. When these units were in production the number one problem that broke of them was the belt. The dead give-away is seeing black bits of belt all over the bottom bed of the ScanJet. Another issue that happens is the backlights will give out from age and stress. Often times you could catch when a backlight is about to go if there’s a lot of black on either side of the connectors. Also, if the scanner head is unusually red that means that it’s cracked and will soon die totally on you.. My belt is perfectly fine and backlights are just okay so lets focus on the scanner head itself. Problem found, dust on the inner deflector mirror. This took a little bit to see, and I had to shine the light just right for it to pick it up on the camera. But deep inside of the scanner head we can see there’s a bunch of dust simply collecting in one spot. There’s a mirror deep inside of the scanner head that runs at a 90 degree angle with very little room to work on it. Cleaning the dust out of the scanner head. Due to the limited room we will have to use Q-Tips or any cotton swap to get into there. Two flooded with Windex or glass cleaner and two dry. 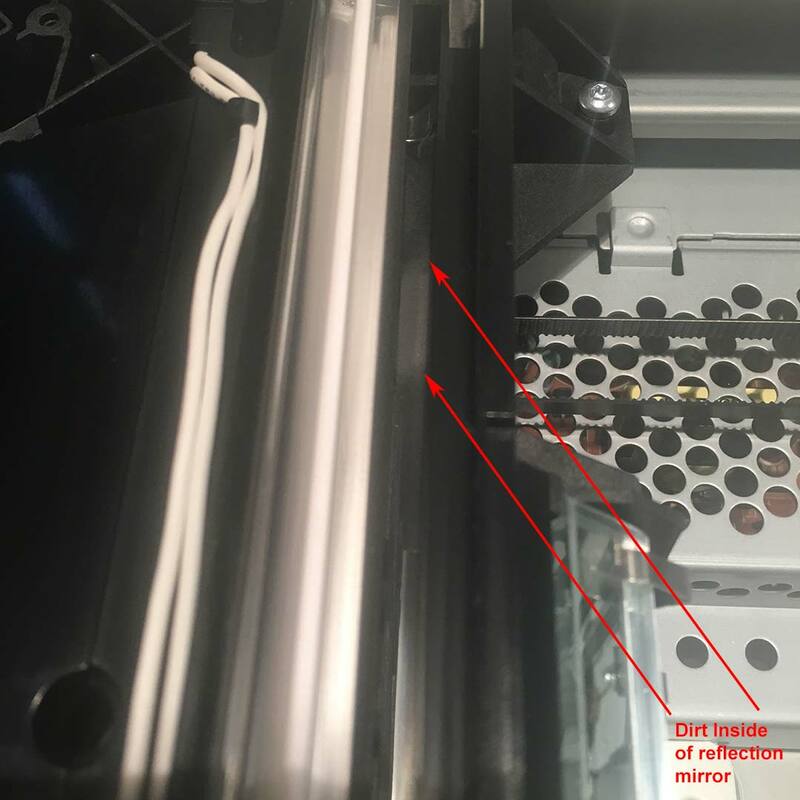 The two dry cotton swaps are very important as you do not want to want to leave any streams on this deflection mirror or else you’re going to see more interesting defects and failure. Once complete, you should see the mirror inside reflect perfectly and you can follow the steps in reverse order to put it back together. As you can see the sketch is totally repaired. No dark streaking anymore and I can resume my weekly scans of random artwork! Repair successful. HP missed a golden opportunity to sell software to keep the scanners going into the future. Because if there is a product that you like and works then why replace it? We are happy that it wasn’t anything more serious such as one of the dying CFFL bulbs inside of the scanner. With about 30 minutes time we were back online and good as new. The automatic brightness if even working again as well within the 3rd party scanner program. All and all I don’t believe in the notion of “Planned Obsolesce” that HP likes to do. It’s wasteful and it’s flat out lazy when you have perfectly good units out there. Instead companies like HP want people to sink hundreds of more dollars on products that stop working after 2-3 years due to software and OS limitations. In many cases vertical lines on any scanner is bound to be an obstruction or just dust. My scanner collected a lot of dust because my bench room is a naturally dusty environment. It has been cleaned now and for that I am pretty happy. If it helps out someone great. If not well we at least thank you for reading. Clean the underside of the glass while you have the cover off. Mine keeps fogging up with some scum. Forgot to mention that it would probably be a good time to clean the glass as well. It’s odd how this scanner collects dust in such weird places. Thanks for checking out this blog! It is appreciated.